I love Aladdin. The whole entire movie, everything about it. And I’ve complained here before that I’m super bummer that I don’t have it on DVD. I know – I could buy it, but I’m waiting for it tocome out of the vault. That way, it will be added to my Disney Movies Anywhere account and I can watch it… well, anywhere! Plus, I’m a strong believer in waiting for the good stuff, especially nowadays when things are so easily obtained. And so, I wait. I don’t know the answer to that one. And that sort of makes me… sad. Hm. Before we kick off the week, it might be a good time to seek out a different perspective. I think an inner reevaluation is necessary every once in a while, don’t you? I like to think that the world would be an amazing, much better place if animals were able to talk. And of course, within the magical world of Disney, they can! Well, most of them can. But even though some characters are not equipped with the ability to speak, they have still managed to win us over time and time again. These animated characters come to life through their movements and facial expressions, so I searched the web to find the best clips I could of each. Here is my Top 10 favorite animals that didn’t need to say a word to make me love them! Mulan had an interesting entourage with her as she entered battle, none of which were what they claimed to be. And even though Cri-kee isn’t truly a lucky cricket, he certainly is one of the bravest little bugs I’ve ever seen. He stays by Mulan’s side as she battles warriors, ridicule, and her own demons. Cri-kee quickly becomes Mushu’s pal, and while Mushu talks to much, Cri-kee’s silence allows him to gain a presence all his own. Kevin’s a… girl? She certainly is, and she’s a girl with a mission. She needs to care for her babies while avoiding capture, and risks her safety for her little ones like any mother would. Kevin’s storyline is truly complex and fascinating when you think about it. For a bird who can’t verbalize her situation, she somehow stirs up a feeling of urgency when she is kidnapped. Still, she also makes us laugh at her weird antics and devotion to Russell. After learning about Kevin’s love for chocolate, it’s no surprise to me that she ended up being a girl! Mischievous Meeko doesn’t seemed fazed by the fact that there is a battle going on over his homeland. All he’s concerned about it getting his next meal. He will be loyal to whomever has the best treats, a trick that John Smith quickly learned. But this little raccoon symbolizes something greater than a cheeky night bandit. He is a friend to Pocahontas, and a friend to all the creatures around him. His silly ways break the tension between Pocahontas and John, and help them reach an understanding. When characters don’t speak in films, they need to have wonderful expressions. Figaro shows his discontent when he is asked to climb out of bed to open the window. He shows annoyance when he has to wait to eat. He’s a fickle cat with many emotions! Gepetto has a very whimsical and enchanting home, full of trinkets and toys, yet this cat is one of the most interesting things in the little house! His attitude is lazy and blasé, the way most real cats are perceived. But Figaro is also a funny, curious kitten who never stops exploring. His adventures might be silent, but they are fun to watch! He’s a reindeer who loves his human Kristoff so much, he even allows Kristoff to speak for him! But happy-go-lucky Sven doesn’t mind at all. He’s grown so close to Kristoff that he can even participate in songs while keeping completely silent. Sven is a good guy to have around. While most of the time he is happy to be helping, and only asks for a carrot now and then, he knows when to put his foot down and demand attention. Like when Kristoff was about to leave Princess Anna without going back to fight for her. Sven stepped out of his laid-back self and silently forced Kristoff to head back to the kingdom. His inability to speak does not make him a 2-dimensional background character. No, Sven has a ton of personality, and makes me laugh with his goofy ways! I wish she could have gone with them! Growing up, I always wished that I could have Nana babysit me in place of the snarky teenage girlsI was left with. Nana is a perfect example of delivering a message with only her expressions. You can see that she cares and loves her Darling’s just as she would her own puppies. Her meticulous care of the nursery is something she is proud of. And you can also see her heartbreak when she is forced to stay outside like… well, like a dog. Without saying a word, Nana runs through the spectrum of human emotions so well that you might forget that she isn’t a real Nanny. He’s a horse who thinks he’s a soldier who acts like a dog. Hm, interesting? Maximum has a lot of moral convictions, more than even some human characters do. He’s a rule-follower, and horse who sees right and wrong as black and white, there is no gray area. He will uphold the law to the letter. The best example of this is when we see the moral struggle Flynn Rider puts Maximus in when he leaves him a bag of apples that he bought “most of.” Maximus is perplexed because he doesn’t want to eat stolen apple. How can a horse who doesn’t speak translate such a strong moral compass? It’s pretty amazing, isn’t it? Where would Aladdin be without his silent partner-in-crime? He understands the way of the world, and knows how to get what he wants. Abu is a clever monkey, but he struggles with his lust for gold and the finer things in life. He, like Maximus, comes to many trials of right and wrong. 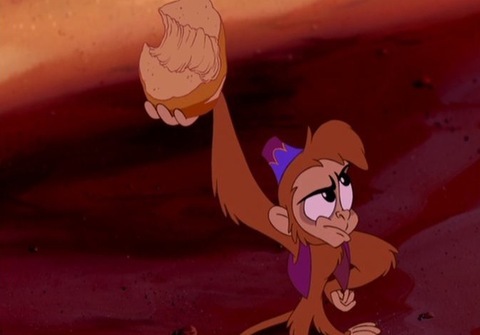 His thieving certainly got the best of him every now and then, but deep down Abu is a loyal and caring companion. He is also very animated and can tell a story, and his feelings, just by acting them out. Pretty impressive! Dumbo proves that you don’t need to speak to star in your own movie! This little guy defies all odds when he “flies”, quiets the naysayers, and creates his own path in the world, all without mumbling one word. Dumbo grows up right in front of our eyes, learns harsh lessons about the world, but takes it all in stride. I don’t believe there will ever be another leading star that can silently win our hearts the way that Dumbo has. #1. Pluto from… lots of stuff! Mickey Mouse’s loyal dog, Pluto, is my number one choice because he encompasses all that personality throughout the decades without needing to open his mouth to speak. He’s naturally a happy dog, but throughout the years we have seen him get angry, sad, confused, and pretty goofy, too. Pluto always makes me smile when I see him. This dog has starred in many cartoons and shorts, and his big ears and dopey smile are recognized across the world. He is the most famous dog who never speaks that I can think of, and he’s also adorable, too! It’s always nice to share, even if we really don’t want to at first!